As office conversations go ours are pretty special. I have my own little isolation cupboard away from the main room so I miss some of the conversations. Once such partially overheard conversation was about the existence of the Cadbury Lime Barrel. You see one of our colleagues had eaten a mystery MisShape of a citrus flavour and presumed it was Lime flavoured, like the chocolates he ate as a boy. The bag was mostly a mix of orange and strawberry centred items so we presume that this was what was sampled but it got us thinking. The lime cordial Barrel was dropped in the late 70s for being a bit old fashioned, but now with changing tastes - should it come back? 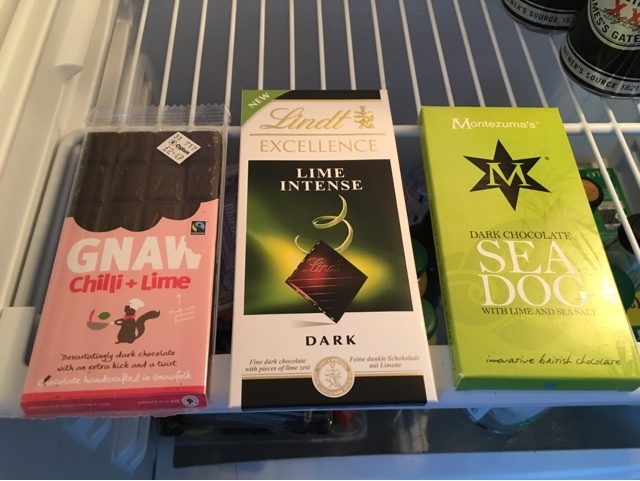 Here in our office fridge we have three carefully selected Lime chocolate brands - unfortunately not with liquid centres. At the end of our weekly meetings I added a chocolate tasting to the agenda and we passed the bars around. First up we have the Lindt Dark Lime intense. This is essentially a big flat bar of dark chocolate with lime peel chunks and a little lemon flavouring. 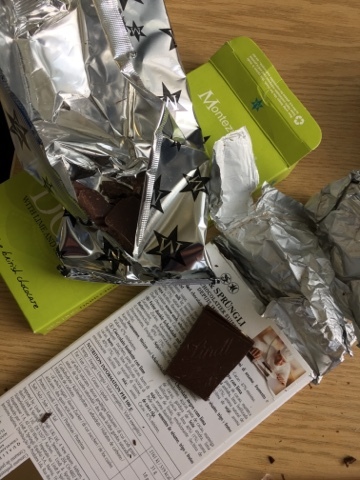 It truly is one for the dark chocolate fans, being a stronger flavour, and the lime is unevenly spread which I liked but didn't lend itself to one cube testing. Some said that this reminded them of lemony cleaning products, but most people haven't eaten those. Next up we had Montezuma's Sea Dog which not only had Lime but sea salt too. To me this more tasted like lime marmalade than the standard flavour of the first bar. By our vintage expert this was declared as closest to the original lime Barrel, but very much a more grown up version. It would be unfair to have declared an overall winner between these two, people wholiked one liked them both. 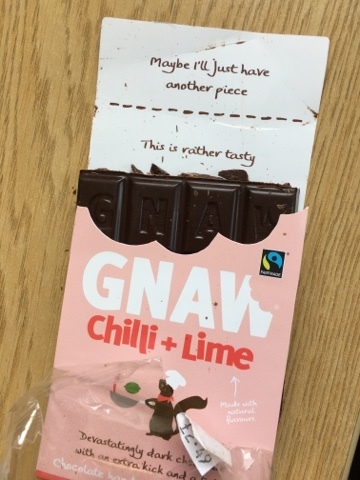 Finally we have the GNAW chilli and Lime, a great brand not just for the variety and cool packaging but also the fact that the best place to get them is Oxfam book shops! Here the main event was clearly the chilli, the Lime sitting as a nice afterthought. Would most people want the intense Lime of the first bars or prefer the chilli, or no Lime at all! Our lime Barrel expert suggested that this would be better with a larger, vindaloo and pickle. He is right in that this is like the mix you get when you add all the toppings at once to your popadom in a restaurant. It's pleasant enough but for me a one or two cube sharing experience where as the lemon meringue bar didn't make it anywhere near work. Three of the six of us preferred the chilli to either of the lime options (one only under sufferance and would have taken almost any other choc instead). Our lime barrel expert preferred the Sea Dog and the remaining two (including me) were happiest with either of the lime options. So not a dazzling victory for the lime then, but with other flavours on offer and the potential of just adding some zest to the top of a bar I think the market may be poised for a minor comeback. That said we didn't find any gooey, liquid lime centres. I'm going to check the obvious places on my next visit to town - but do feel free to mention any you have seen in the comments below! Ah, echoes of the Crunchy Frog sketch from Monty Python... "Lime Creme, a very popular flavour I'm led to understand". tahrey - Hotel Chocolat do a posh version if that is any help? Yup - Thorntons and Hotel Choc are my best bets, but the small Thorntons do not have them.